The first thing a gamer understands when they put their hand on a Razer gaming mouse is not how powerful it is, but how nice it feels. 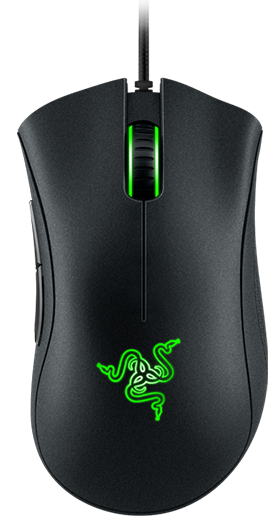 Every button placement and every curve on our mice was created to fit snugly with your hand. Unlike mass-market office-grade pointing devices, Razer mice are designed with ergonomics that deliver above and beyond what ordinary ones can offer. As such, ours go through rigorous testing with a wide range of hand shapes, sizes, and grip types to find what the best fit is for everybody. With every new Razer gaming mouse we create, we improve the ergonomics to continue to give you the most comfortable gaming experience. 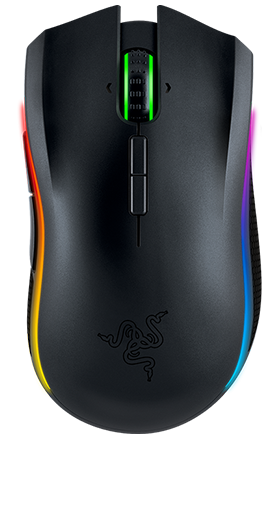 The gentle sloping and long mouse buttons of the Razer DeathAdder Chroma, combined with its rubber side grips, makes it the optimal mouse for claw grip users, whereas the compact design of the Razer Orochi would suit a fingertip user. Our mice also come in right-handed, ambidextrous or left-handed models – get the one that’s most comfortable for you. Interchangeable side panels allow you to get just the right hand fit with your Razer gaming mouse. On the Razer Ouroborus, create an ambidextrous form factor with the detachable wings on either side of the Razer Ouroboros. 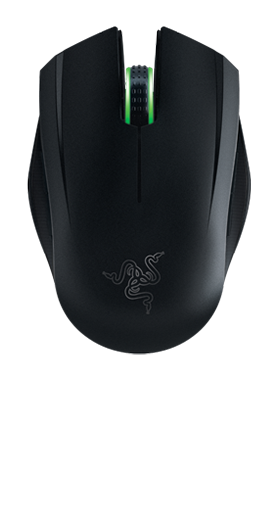 The Razer Ouroboros features a retractable arched palm and back rest. If you have long fingers, pull out the back as far as possible so your fingers sit over the mouse instead of having to curl. If you have a smaller reach, push the back closer to the front of the mouse for a more compact form factor. With the popularity of the massively multiplayer online (MMO) genre taking off, an idea was born to find an easier way to access all the skills at your avatar’s disposal without having to take your fingers away from the movement keys. Ergonomic studies showed that while the thumb on our mouse hand is an under-used digit, it can certainly be trained to be as precise for button actuation as any of our other fingers. The revolutionary thumb grid buttons was born, designed to ensure all your essential keybinds are within easy and comfortable reach. 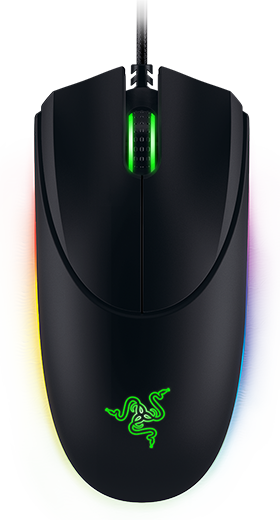 The Razer Naga Epic Chroma and Razer Naga Chroma have a twelve button thumb grid, suited for the expanded skillsets found in most MMO games. Multiplayer online battle arena (MOBA) and action role-playing games typically have a simplified skillset of seven or less actions for more focused play. 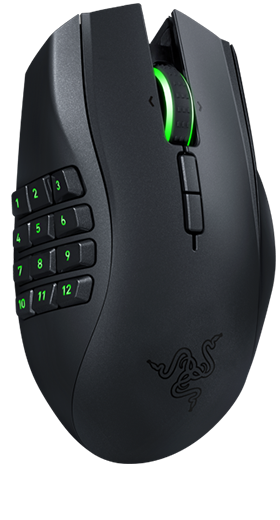 As a result, the Razer Naga Hex v2 was designed with a seven mechanical button thumb grid. As the world of gaming evolves, both games and gamers grow more demanding with new needs to stay ahead of the competition. 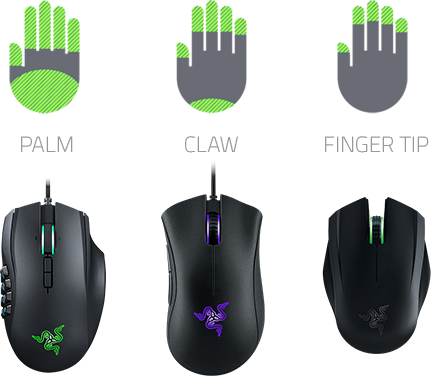 Each Razer mouse is continuously being improved upon, so that you can bring your A game, even with the latest titles. 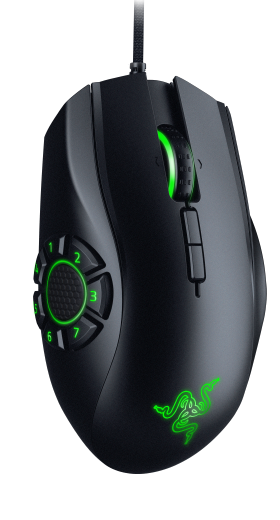 To give gamers the advantage of being able to adjust the lift-off distance, most Razer mice come with surface calibration capabilities via Synapse — manual and preset calibration. The manual calibration process involves moving the sensor slowly over your choice of surface, enabling it to capture information about the surface in almost microscopic detail, determining the average distance of the surface from the sensor. Synapse then assigns a range of optimal lift-off distance values for you to try out and determine which is best suited for your playstyle. 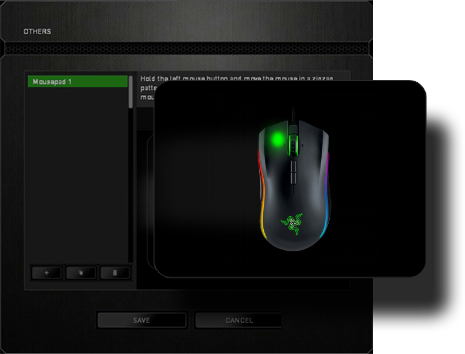 The preset calibration settings allow you to select which Razer mouse mat you’re using, then automatically loads values for both the mouse mat and sensor. These values are determined after rigorous field-testing to ensure that you enjoy a consistent high performance when your Razer mouse is paired with your Razer mouse mat. Lift-off distance is the maximum height your mouse sensor can be from the surface before it stops tracking, and it determines how much unintended movement is registered when you reposition your mouse. The higher the lift-off distance, the more your cursor will move on screen when you lift up and put down your mouse. The optimal lift-off distance for you, depends very much on your playstyle, though generally, a shorter lift-off distance is preferred. The lower the DPI on your mouse, the, the more important lift-off distance is for you, as you would frequently need to reposition your mouse. Low-sensitivity pro-gamers who do a lot of broad-stroke swiping with their mice have to pick them up when it hits the edge of the mats to reposition at the centre. Some mice when lifted like this may cause on-screen cursor jitter as mouse-to-surface tracking continues. This is a detriment to gamers who need absolute accuracy in their games, as the cursor being thrown off a target might mean the difference between winning and losing. 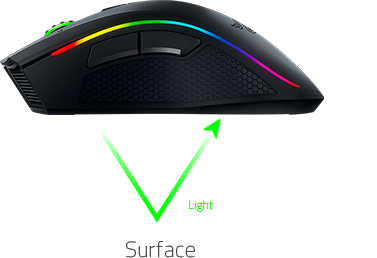 In a Razer gaming mouse, once the sensor has been calibrated to the surface (see “Surface calibration”), you can customize the height at which tracking is cut-off when the mouse is lifted. This ensures on-screen jitter is reduced; so your aim stays dead-on target even as you move. What is your preferred mouse form factor? We designed a whole range of gaming mice to suit a variety of play-styles, hand shapes, grip-types and cosmetic preferences. What they all share in common are highly precise sensors guaranteed to deliver the best performance. The question is which mouse suits you best? 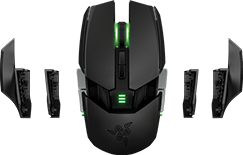 Use this handy mouse selector to find the right one to suit your needs, and then either head to RazerStore or your local retailer to pick it up. You have a whole range of skills, spells, macros at your disposal. How are you going to access them all quickly and with the ability to mouse wirelessly? Its diminutive size belies its true power – a 6400dpi laser sensor and Bluetooth wireless connectivity. Its just as powerful as its larger sized brethren, but the beauty is you can fit this in your pocket for precise gaming on-the-go. 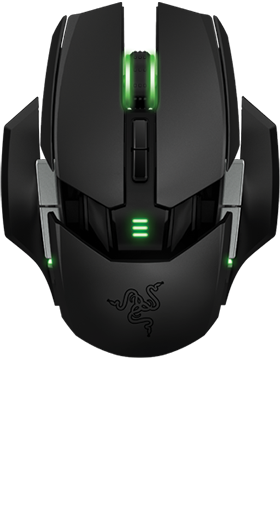 Wired/wireless functionality, a highly comfortable form factor, and highly precise mouse sensor – yes, the Razer Mamba is amazing. 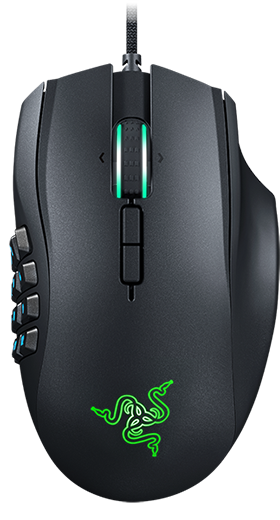 All you need is a character, six skills, the right items, a lane, and your Razer Naga Hex v2 to dominate in any MOBA game. You demand only the best, and the Razer Ouroboros lets you customize every single feature – from the side grips, to the arch on the palm rest, to how long or short the back is – so you are in complete comfort and control over your gaming weapon of win. The Razer DeathAdder’s form factor is perfect. When you place your hand down on it, feel how its contours hug your fingers snugly. Now you’re ready to game in comfort all night. You have a whole range of skills, spells, macros at your disposal. How are you going to access them all quickly and easily? With the Razer Naga, that’s how.